Ouray is now a picturesque town loved by tourists (especially hikers) in the scenic San Juan Mountains. But let this not deceive you. Ouray, like many historic places in Colorado, began as a rich mining camp. The town was established when miners flooded the area looking for their fortune in the rich gold fields. Today it is designated as a historic district with many historic structures from the early days of gold mining in the state. It offers great opportunities for gold prospectors to find gold. In addition, there is a lot to see and do in the surrounding mountains making it a perfect destination throughout the year. 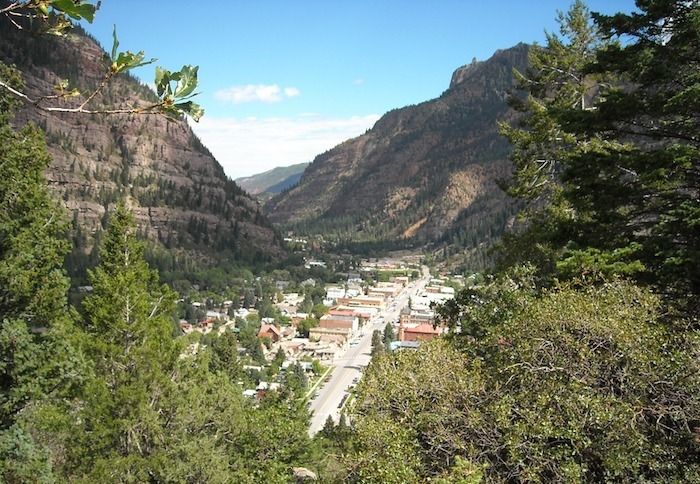 Before the gold miners arrived here, the area surrounding the modern day Ouray was home to Tabeguache Ute, Native American tribe that had lived in the area for centuries. The mountains around Ouray have a lot of natural hot springs which the natives treasured for their therapeutic qualities and considered them to be sacred miracle waters. A boy named Ouray was born in 1833. The boy grew into a very wise and fearless warrior. He was also multilingual speaking English, Spanish and the native Ute language. Later he was made the chief of the Uncompahgre Ute. He was the chief of the community at the time the white miners descended on the region in search of gold. Using his intelligence and great diplomacy he helped avoid war and great massacre as was witnessed in other areas where the natives were forced from their lands by the influx of miners. Because of his great leadership, he won the respect of both the United States Government and that of his Ute Nation. In his honor, the greater Ouray County and the town of Ouray were named after him. He died in 1880 years after the two had named after him. Reports of gold discovery in the area around the modern day Ouray came out in the early 1870s. By 1875 an influx of white miners chasing gold and silver was witnessed in the area for the first time. Several gold veins were established in the area with the most notable being the Una and Gertrude gold veins discovered in the Imogen Basin by George Barber and William Weston in 1877. Thomas Welsh acquired the two Veins and later established the Camp Bird Mine in 1897. He later built a twenty-stamp mill for the mine before selling it to the Camp Bird Limited in 1902. The Mine had produced over a million ounces of gold by 1916. Starting in 1876 several smaller gold miners were established in the area around Ouray. This brought in thousands of miners leading to the incorporation of the town in October 1876 when it had a population of about 1,000 people. Mining in the region continued to grow and when Ouray County was established in 1877 the town became its county seat. At the height of gold mining in Ouray, the region around the town had over 30 active mines and the town was an important trading center for the mines. The Denver and Rio Grande Railway connecting the town was built in 1887 and was in operation until 1953 when it was abandoned. The Yankee Girl Mine was one of the earliest gold mines established in Ouray. The mine was very productive producing over $8 million worth of gold. Several other mines played an important role in the growth of Ouray as an important mining district, but it is the Camp Bird Mine that remained the most productive mine in the area. The Mountain Top Mine was the most recognizable mine in the area especially after 1919 when it was featured on the cover of the Scientific America because it had the first underground mill in the United States. Mining in Ouray continued into the 1940s when the rich ore had played out. The country produced a significant amount of silver, gold, and copper among other minerals. Today Ouray is a great destination for traveling prospectors seeking to find gold and explore mining areas in Colorado. There are great places in the surrounding hills and mountains where you can discover gold nuggets. It is noteworthy that the gold found in the mountains surrounding Ouray is often discovered in fine veins within rock. This gold is sometimes small in texture, yet some specimens are very rich. A very sensitive gold detector will help you locate these rich ores. For years, the trusty Fisher Gold Bug 2 was the detector of choice for this area to scan old ore piles. I have found that the new Minelab Gold Monster 1000 works even better. It cancels out the ground noice and helps to isolate the sound of the gold. You can also visit some old gold mines that still admit visitors and prospectors looking to try their hands at gold mining. In addition to gold panning, you can take time to learn about the rich history of Ouray. The Ouray County Historical Museum housed in the original Saint Joseph's Miner's Hospital completed in 1886 provide important pieces of history to take you back in time. In the museum, you will see an impressive collection of minerals mined in the area, Victorian-era displays, Ute Indian artifacts, and a host of other historical exhibitions. Ouray's main street, the Walsh Library, the Ouray City Hall and the Beaumont Hotel are all registered as the National historic district. All the original permanent buildings built between 1880 and 1900 within the historic district have been restored and are open to visitors.